I’ll be reading at Lady Jane’s Salon Lancaster along with fellow authors Holly Bush, Caridad Pineiro, and Sara Humphreys. Come hear a snippet of THE COWBOY’S CHRISTMAS BABY before it is released. The event will start at 1 pm and will be located at the Cat’s Meow in Manheim, Pennsylvania. More details can be found here. Hope to see you there. 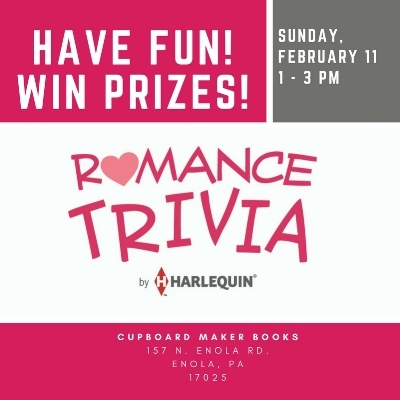 Come join me and Harlequin author Geri Krotow as we play Romance Trivia. The event is on February 11, 2018 from 1-3 pm and will be held at Cupboard Maker Books. I hope to see you there. Release week fun and prizes over on Facebook. July 18th from 11:00-6:00pm EST join myself along with Kyra Jacobs, Jody Holford, and Jennifer Shirk as we discuss "This or That". My debut romance from Entangled Bliss will release on July 17, 2017. More details to come. Thrilled to announce I have signed a three book contract with Entangled Publishing!!! Look soon for details about my Fly Creek Home series.